Blunt-nosed Leopard Lizards are an endangered species, primarily due to habitat destruction. 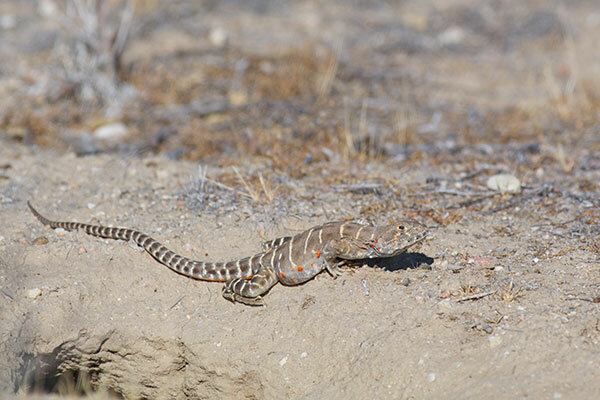 They used to range far and wide across the grasslands of California's San Joaquin Valley, but nearly all of their original habitat has been converted to agriculture or rangeland and made inhospitable for these lizards. I had searched for this species unsuccessfully at least six times before finally coming across this beautiful specimen. Since I was heading from the central coast of California down to the deserts, I thought I should stop by Carrizo Plain and look for some more leopard lizards to photograph. My friend Jackson Shedd had given me some useful advice about the area where he had seen them earlier. His advice was sound, as I came across five of these fine lizards in the couple of hours of prime morning basking time, before it got too hot. Unfortunately four of them saw me before I saw them, and I only witnessed them bolting off to the safety of the nearest burrow. 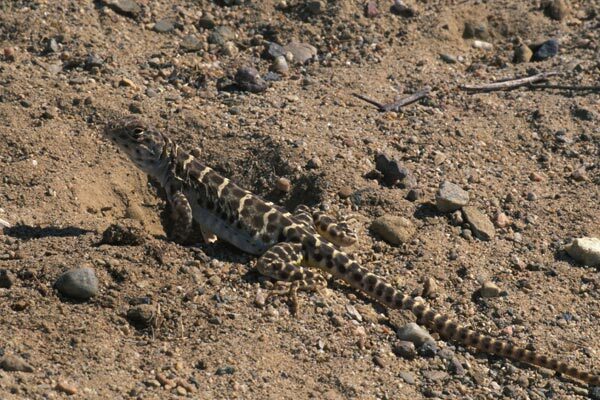 This was the lone leopard lizard that I saw first, and even with my careful slow approach it too disappeared into a burrow just after I got this photo. The California Department of Fish and Game has a page on this species. The San Joaquin Valley Endangered Species Recovery Program site has a page on this species.